Every month, Born and Raced in West Liberty will highlight a runner from the West Liberty area. WHY AND WHEN DID YOU START RUNNING? Corey Frost: When Coach Lehman first returned to West Liberty, he invested in the youth of the community by coaching little league baseball. Many of his distance running recruits came from his West Liberty Reds baseball teams. A couple of weeks before the beginning of my 7th grade year, Coach visited my home and spoke to my parents and me about cross country. I didn't know what cross country was. That was August 1974. Coach was very convincing. Butch Sower: I played little league baseball for Coach Lehman. I really looked up to Coach in baseball, so it didn't take much to convince me to come out for cross country. Mark Plank: I started the fall of my 8th grade year, 1974. Coach Lehman was my little league coach and after the season was over he stopped by and told me I was running cross country that fall, so I did. Scott Bacher: Coach Lehman would send me letters all summer telling me of the get togethers at his place trying to coax me into running cross country. I was flattered but laughed and threw his letters away. I can remember the first day of school freshman year, Coach pulls me aside with Butch Sower and tells me "Butch is going to get a varsity letter this year and you can too." He told me he wouldn't push me, to just do what I can. One of the BEST DECISIONS OF MY LIFE! By the end of the year, I was running varsity races. The rest is history. FAVORITE BIG ORANGE MEMORIES. Bruce Hooley: The state championships are great memories, of course. I'll never forget the exultation of the immediate aftermath of that 1976 championship. We didn't just win. We dominated with five runners in the Top 20. No school had ever done anything like that before. What I look back on now is how the work ethic necessary to win at that level ingrained an understanding of what's needed to achieve anything in life. I always believed we would win, not because I was certain we were the best runners, but because I knew it was absolutely impossible that any team had worked harder than we did. I distinctly remember having that conversation with my teammate Scott Bacher, the night before the 1977 State Meet. "Is it possible any team out there has worked harder to win this than we have?" I asked him. "No," he said. "That's not possible. No way." The next day, we placed six runners in the Top 19, and won our second straight state title. Scott Bacher: Too many to recount...of course running at the State meet and winning. Coach Lehman never let us get overconfident about winning (even though we knew it). We always believed we would only if we ran our best. Corey Frost: My favorite memory from '77 was seeing all that orange at the front of the pack and knowing that a championship was in reach. Also, stepping to the stating line at the Scarlet and Gray golf course (the location of the state meet course) is an experience that no one should ever forget. Mark Plank: The 1978 state championship, coming down the final straight-away with Ken Day and hearing people say, "there are two more of them!" We had 4 of the top 7 runners in the state that year. Also, having visiting teams get off the bus, take a look at the Ohio Caverns and saying "how can we run up that?" DESCRIBE A TYPICAL COACH LEHMAN WORKOUT: Scott Bacher: PAIN!!!! Distance workouts were always high mileage and we pretty much raced each other every day. Not much of a rest day at all. Coach would never tell us how many intervals we were going to do. I can remember almost being in tears during these especially painful workouts. He would always tell us and we believed him, "There is no way anyone else is working harder than you guys now." This was a great confidence booster. Ken told me later on that he "wished he knew then what he did now." He would have built in some rest days. He said, "imagine what you guys could have done if I did that." Bruce Hooley: Our distance work in the early to mid season involved jogging a mile warm-up and then seven, eight, or nine laps of the Ohio Caverns loop, approximately one mile for each loop. Yes, that included seven, eight, or nine trips up hill. That's why no one ran hills better than we did. Our senior year, we never cut one workout short. Not one. Coach Lehman told me before the state meet that he designed the workouts, assuming we would complete three-quarters of what he scheduled. Corey Frost: There was so much talent and incredible competition that workouts were really just mini-races. For those who endured, the reward was exhilarating. I learned my lesson in '77 and thereafter heeded Coach Lehman's mantra that championships are won in the offseason. WHAT ADVICE WOULD YOU GIVE MIDDLE SCHOOL OR HIGH SCHOOL RUNNERS? Corey Frost: Train hard during the offseason and remember that cross country and track and field are team sports. Also, trust your coach! Mark Plank: Have fun and work hard! Scott Bacher: The biggest change I made from being a "running weany" to a State Champion was in my head. When I got tired, I thought it was time to stop. I thought the pain meant that I just wasn't a long distance runner. Start off with what you can do then add some each until you have the confidence to keep up longer. I tell my athletes and students (I actually got it from Ken), "A Champion will work until they get tired, until they don't feel they can take another step...then they work some more! He would also tell us, "Championships are made in the off-season." Come into the season in shape. Don't use the season to get in shape. Butch Sower: "Don't put limits on yourself. You can always run longer and faster if you put your mind to it. Be gutsy and run with heart. Bruce Hooley: Run at least five days a week, assuming your not injured. Do not run injured, but you must run through pain. There's a difference. Learn that difference. And remember, the hardest steps are the first ones out the door. Scott Bacher lives in Spring, Texas and has been married to his wife Sue for almost 33 years. He has four daughters, Emily, Hannah, Lauren, Liz, and two grandchildren Enzo and Rhys. He is retired from public education after 33 years and is currently teaching at Founders Christian School where he coaches cross country and track. Scott always says he thanks Ken Lehman and Earl Zilles for his family. He went to Houston originally because Ken was coaching for the University of Houston and Earl was running there, and that is where he met Sue. Corey Frost graduated from WL-S in 1980 and attended Cleveland State University on a track scholarship. He achieved his undergraduate degree from CSU in 1984 and graduated from Case Western Reserve School of Law in 1987. He was admitted to the bar of the Supreme Court of Ohio in November of 1987 and has practiced law ever since. Corey lived and worked in Cleveland until 2007 and has lived and worked in Florida, Vermont and Nebraska. He is currently living in West Liberty caring for his mother. He continues to practice law, focusing on business and entertainment law, family and matrimonial law, and more recently criminal defense. Corey along with Big Orange teammate, Earl Zilles give pep talks and share Big Orange stories and history each cross country season with the current Big Orange boys and girls teams. Bruce Hooley hosts a morning sports radio show in Columbus on 105.7 The Zone. Bruce and his wife Sheri, a former professional golfer, live in Plain City on a mini-farm with one horse, three dogs, eight chickens, and three daughters ages 14, 12 and 8. Butch Sower is a carpenter and jack of all trades, living in the Cincinnati area. He is the big brother of the current Big Orange cross country and Tiger track and field coach, Ann Vogel. After recovering from a serious foot injury, Butch is currently running again. The West Liberty-Salem Athletic Hall of Fame induction weekend includes a recognition of the athletes at the varsity boys basketball game, Friday, February 9th with a dessert buffet following the game. The formal induction is Saturday evening. For ticket information, contact the WL-S Athletic Department at 937-465-1149. Emily and Team Klara finishing a race to raise money for the RYR-1 Foundation. Emily and Team Klara finishing another race! We'll kick off 2018 with our January Runner of the Month, Emily Yoder Pedersen. Emily is a 1994 graduate of West Liberty-Salem High School. She went on to run for Bowling Green State University where she graduated in 1998, and received her masters at UNC-Greensboro in 2000. Currently, Emily is living in New Jersey with her husband Darren and their two daughters, Lillian and Klara. She's a stay-at-home mom, and works per diem as a child life specialist/recreation therapist. She sits on the Board of Trustees for the RYR1 organization and is an active advocate for research for muscle disorders. WHEN DID YOU START RUNNING? I started running cross country in 7th grade after my friend Betsey and I accidentally signed up for it. I could not run the two mile race without stopping my entire 7th grade season. True Story! I did continue running both track and field and cross country through junior high, high school, and college. WHAT ARE YOUR PR's? My PR's are approximations, I can't remember them all! 800-2:17, Mile 5:35, 5K 19:10, Half Marathon 1:37:45, Marathon 3:49, 10 mile 1:12. I have also competed in countless sprint triathlons, Olympic distance and one Half Iron Man (finish time 6 hours, 17 minutes). WHAT ARE YOUR FAVORITE RACES? My favorite race distance is the half marathon. My most memorable races include my high school conference (West Central Ohio Conference) my junior year where I won the 800 and broke our school and conference record, college cross country receiving All-Ohio honors my sophomore year, and my college senior year running the 800 at the Ohio State Horseshoe. Post-college, my most memorable race is the Half Ironman in 2009. I also love the Wildwood race series/Half Marathon. The course runs along the world famous Wildwood Boardwalk and the ocean, so the scenery is amazing. I have run this race for five years with some of my best friends., husband, and daughter Lily. ARE THEIR RUNNERS WHO INSPIRE YOU? I don't know that I have any specific runners who inspired me to be a runner. Running the streets of West Liberty, the hills at and around the Ohio Caverns with my teammates, challenging each other, having fun, and making memories kept me coming back. What really inspires me other than a specific person, is the feeling I still get when I toe up to the starting line, the atmosphere at any race, the nervous excitement, and of course the PR. This keeps me running. Now, what motivates me to run farther and faster, more than anything isn't a runner, or a feeling, but a little girl who hopes to have the ability, not to run, but to be able to simply stand. I now run with more purpose than most, I run for my daughter Klara. Klara was born with a rare muscle disorder, RYR1-related myopathy. After she was born, I had a very strong desire to do what I could do to help find a cure for her. So I turned to what I know, RUNNING. Running for Klara inspires me to run in a way I have never been inspired before. I watch her in therapy, working so hard to learn how to do the simplest of things, and at home trying to scoot across the floor or pick up her cup of water, and I realize just how fortunate I am to be able to run. I don't take it for granted and I enjoy running even more. When I am out on a long run and I'm tired, I think of Klara. I know what I ask of her is so much more challenging than what I ask of myself, so I run a little farther and a little faster. 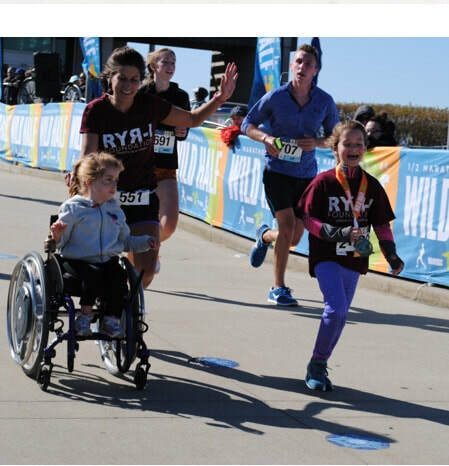 TELL US ABOUT YOUR WORK WITH THE RYR1 FOUNDATION: For the past seven years, I have put together a team of friends and family, all who run for Klara. They come from various backgrounds-college athletes to no athletic background and everyone in between. "Team Klara" has raised over $75,000 in the past seven years, all of which has been donated to research for Klara's muscle disorder. WHAT ADVICE WOULD YOU GIVE TO NEW RUNNERS? You don't have to be the fastest or the runner with the most graceful stride. You just have to enjoy it. Thanks, Emily! We're so thankful that you stuck with running after the 7th grade! Your story is inspiring and gives the term "running with purpose" a whole new meaning. Long may your run. 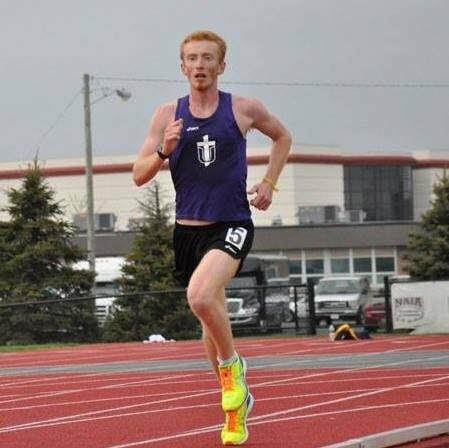 Aaron Scott continued his cross country and track and field careers at Taylor University after graduating from WL-S. Hot off his West Liberty Luminaria 5K Run last weekend, Aaron Scott is our December Runner of the Month. Aaron is a 2013 graduate of West Liberty-Salem and was part of the 2011 and 2012 Big Orange state qualifying teams. He went on to run cross country and track and field at Taylor University in Indiana, and is currently pursuing his Doctorate of Physical Therapy as a first year graduate student at the University of Dayton. WHEN DID YOU START RUNNING? I started running in 7th grade cross country under Coach Mike Louden. I remember only caring about soccer and getting so mad when my mom made me go to summer conditioning for cross country. Mom always knows best. I ran for two years in junior high school and four years in high school. I then went on to run cross country and track (indoor and outdoor) for four more years at Taylor University. Now I'm an unaffiliated amateur runner, also known as "retired but still kicking." WHAT ARE YOUR PR's? 1500-4:18, Mile-4:37, 5K-15:31 (indoor track), 10K-32:00 (outdoor track), Half marathon 1:12:16, Marathon 2:53:15. It's also worth noting that I once ran 200 meters in 46 seconds whilst juggling three tennis balls. It's called joggling and it's worth a Google. WHAT ARE YOUR FAVORITE RACES? My favorite race in high school was probably the Greenville Treaty City Invite. It used to be one of the largest meets in the state and it was a beautiful area with great music, and of course, a cannon start. In college, my favorite race was the Louisville Classic XC meet. There was always fantastic competition, the course was superb, we stayed in nice hotels, drove charter buses and always went to a delicious BBQ place afterwards, all courtesy of the program's wallet. HOW HAS RUNNING CHANGED YOU? That is one huge question. Besides my faith and family/friends, running is probably the most impactful area of my life. It has taught me the art of discipline and hard work in all areas, including academics, relationships, faith and more. Part of the reason I can push through hard times is because running has taught me to persevere. Sometimes, you have to push through even when you want to slow down, even when you think you can't handle any more. Not many activities teach you that lesson quite literally as running. Most importantly though, running has had such a huge impact on my faith in God. I believe running is a gift God has given me, along with the joy and passion I have for it. Every time I run, I am delighting in what God has given me. He's not just an all-powerful, sovereign ruler. He's given me so many blessings in life to find joy. Running is near the top of that list. It has allowed me to see God's hand in pain, in rest, and in passion. I've seen God through running more than almost any other area of my life. That's something I'll cherish the rest of my life. 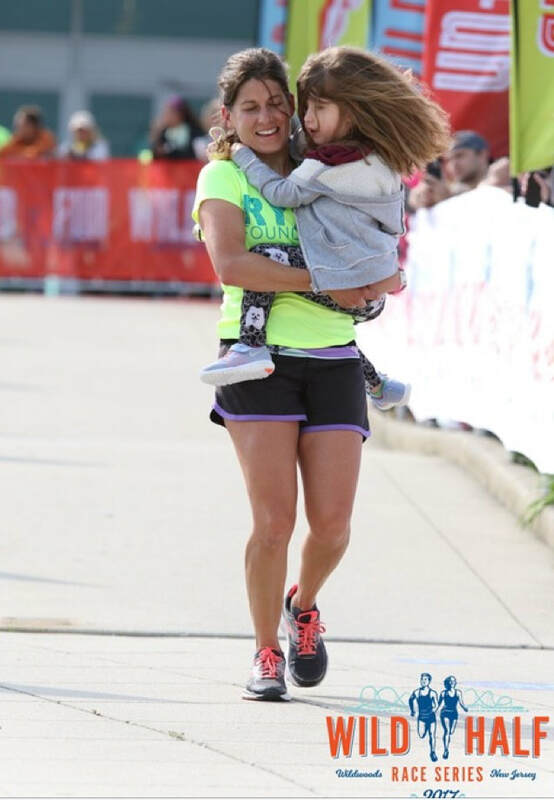 ARE THERE OTHER RUNNERS WHO INSPIRE YOU? I've had a few inspirational runners over the years. Ryan Hall was there in high school. He hold the unofficial American marathon record and is a great example of faith incorporated into running. Aaron Crull was a teammate in college who I looked up to a lot. He paced me to my first sub-16 5K and my first sub-33 10K, and was unwavering in his positivity and encouragement. He also had an unshakeable faith that I have yet to see in another human being. Finally, Coach Louden. He's not a runner, but he's had more impact on my running than any other person. He started by including me, making an introverted 7th grader feel welcome with jokes and encouragement. He taught me how to be a leader, how to work hard, how to get up after being knocked down, and how to sprinkle in a little fun, too. I would definitely say that he's one of the people that I respect the most. He's given so much to the Big Orange cross country program and so much to me personally. WHAT ADVICE WOULD YOU GIVE TO NEW RUNNERS? I'd probably have two things: First, keep going. Running is an absolutely acquired taste. Once acquired, it is a beautiful blessing and one of the most natural activities known to man. Second, always do 95% of what your coaches tell you. Your coaches know what they're talking about. They've been around the block and they have experience. Trust them and respect them to the best of your ability. Do your best for them because they're doing it for you. Always engage with the training and make sure you're doing what's best for you personally. Research stretches or little exercises that challenge you in new ways. Most importantly, that 5% of variety helps you to engage in the sport, invest in the training, and have fun instead of just being a robotic runner who always follows arrows and lines. Always engage! Thanks, Aaron! After doing some extensive research, we here at Born and Raced in West Liberty have found that you hold the village's record in joggling! All the best to you, and long may you run. ​​Our November Runner of the Month, and arguably the most famous runner from West Liberty is Earl Zilles. Earl is a 1980 graduate of West Liberty-Salem where he was a member of the 1st state championship cross country team in school history in 1976. After being sidelined by stress fracture in 1977, he was also a member of the 1978 and 1979 state championship teams. Coached by Ken Lehman, Earl went on to win back-to-back individual state titles in cross country (Class A) in 1978 and 1979. In track and field, Earl was a state champion (Class A) in the 2-mile in 1979 and 1980 and also won a state title in the mile in 1979. Earl still holds the 3200 meter record at WL-S in 9:25.6, set at the 1979 state meet. Earl went on to attend the University of Houston where he was once again coached by Ken Lehman and qualified for the NCAA Cross Country Championships in 1980 and 1981. In 1982 he earned All-Southwest Conference honors with his 3rd place finish in the steeplechase. 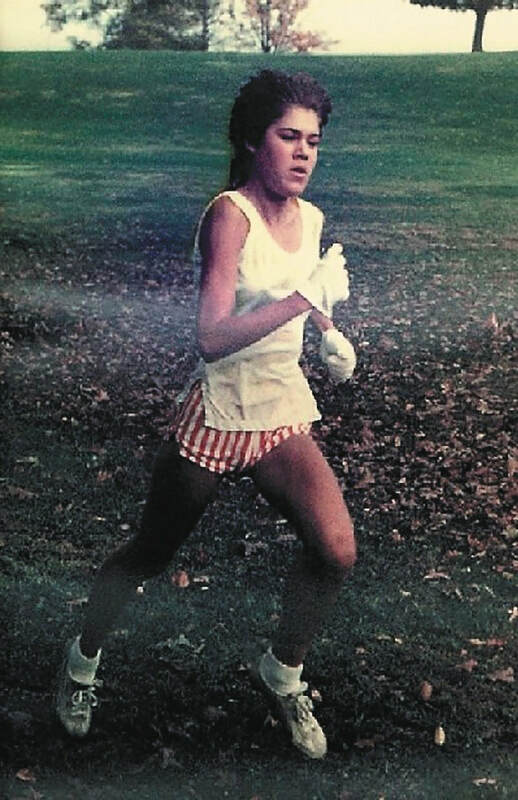 After college, Earl coached the 1st girls Big Orange cross country team at West Liberty-Salem from 1982-84, and led Maria Newcomer (see October's Runner of the Month below) to an individual state championship cross country title in 1983 and the 3200 meter state track and field title in 1984. While coaching the WL-S distance runners in track and field, he also led the girls 3200 meter relay teams to 2 All-Ohio performances in 1983 and 1984. Earl has had a very successful road racing career. In 1998, he finished 19th in the Columbus Marathon (2:35.09), and ran the Boston Marathon three times, finishing 157th (2:41.17) in 2000. Earl ran the Los Angels Marathon 13 times and in 2000 finished 33rd (2:40.35). Earl's biggest road racing win was the Columbus Night Moves 5 Mile (25:04) in 1983, three days after he ran his fastest half marathon at the Dayton River Corridor, (1:08.10). In total, Earl has competed in 37 marathons with 24 of them raced in sub 3:00 hours, 14 under 2:50 and seven of them under 2:40. Earl's success as a runner has earned him induction into several Hall of Fames. In 2010, he was inducted into the West Liberty-Salem Athletic Hall of Fame, in 2013 he was inducted into the Ohio Association of Track and Cross Country Coaches Hall of Fame, and in 2016 he was inducted into the Dayton Distance Running Hall of Fame. Earl continues to support our Big Orange cross country and Tiger track athletes. Every year he gives the athletes a post-season pep talk and has been an outstanding support system for WL-S coaches. Earl lives in Bellefontaine with his wife, Cathy, and works as a staff engineer at Honda of America. When Earl's not running, he enjoys spending time with his grandchildren Lulu and Hutch, watching Buckeye football, and golfing. He also can grill a mean brisket. Congratulations, Earl! Long may you run. WHEN DID YOU START RUNNING? 7th grade cross country. WHAT ARE YOUR RACING PR's? 5K 14:30 (Road), 14:28 (Track). 10K 30:10. Half Marathon 1:08.10. Marathon 2:35.09. 2 mile 9:15 AAU Jr. Olympics and High School Track 9:25.6. 2.5 mile cross country 11:42. FAVORITE RACES? BOSS Summer Run, Liberty Half Marathon, and Ohio Caverns Alumni 5K. FAVORITE RUNNING MEMORY? Winning our 1st team state title in 1976. FAVORITE COLLEGE AND COACHING EXPERIENCES? Qualifying for the NCAA Championships in college and for coaching, it would have to be the 4x800 relay team taking 30 seconds off their time from Regional to State and placing 3rd overall. WHAT ADVICE WOULD YOU GIVE TO A BEGINNER RUNNER? Make it fun (winning helps). The best advice I was given was from Ken Lehman. He said "championships are won out of season," meaning you need to put in the work during the off-season to be ready to win. Make sure you run, even on the worst weather days because those are the days that beat your competition! YOU ARE SUCH AN INSPIRATION TO THOSE RUNNING IN OUR COMMUNITY. ARE THERE ANY RUNNERS WHO INSPIRE YOU? The runners who inspire me are the Big Orange Alumni that came along before me. I won't mention all the names because I'd probably leave someone out. One that does stick out would be Duane Yoder. He overcame his broken knee cap in the Fall of 1975 that ended his cross country season, and then turned around and led us to our first state championship the following season. He never complained during or after practice even though I knew he was in pain as I would see him icing his knee all the time after workouts. Our October Runner of the Month is Maria (Newcomer) Gleason. Maria is a 1984 graduate of West Liberty-Salem and a 1990 graduate of the University of Findlay. Maria was on the first WL-S Big Orange girls cross country team in 1982, and was also the first female state champ in any sport at WL-S, winning the DIII State Cross Country title in 1983. In 1984, Maria also a state champion in the Ohio DIII 3200 meter run and still holds the WL-S school record in that event (11:18) as well as the WL-S 5K cross country record (18:04). Maria was coached in high school by Earl Zilles and Alan Keirn. Maria resides in Findlay, Ohio, where she has been a Social Security Claims Representative for 26 years. 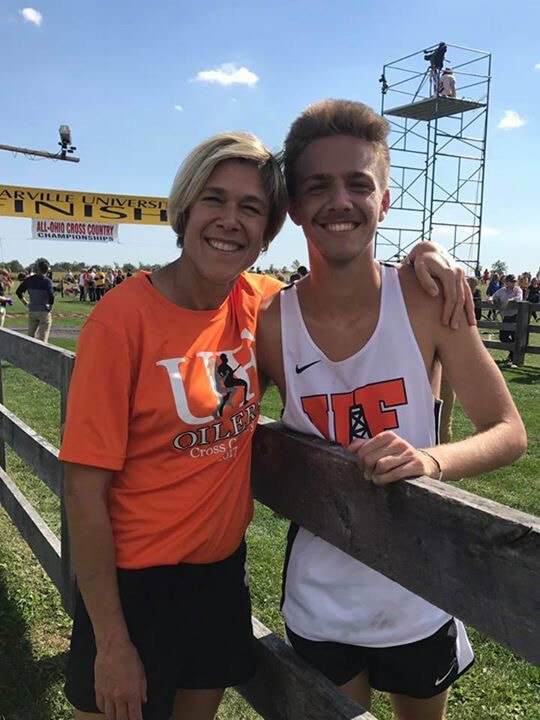 Maria is also the mother of Ty Gleason, who currently runs for the University of Findlay, and Tara Gleason, who is a member of Liberty Benton High School's cross country and track and field programs. PERSONAL BEST TIMES: 3200 meters - 11:18, 5K 17:39, 10K 37:25, Marathon 3:13. WHEN DID YOU START RUNNING? I've been running since I was 8 years old when my dad (Art Newcomer) and I "trained" for my 800 meter race in the Jr. Olympics back when we lived in California. We ran one mile everyday! So I've been running for over 40 years now. WHAT'S YOUR FAVORITE RACE? My favorite distance was always 10 miles/half marathon. My favorite places to run are on any really cool trail. My favorite weather is about 15-20F, maybe some wind and little icicles forming on my face. I always loved running around the countryside in West Liberty with its rolling hills and cows in the field who would moo back at me when I mooed first. WHAT ADVICE WOULD YOU GIVE A BEGINNER RUNNER? Stick with it! Once you have your first experience with "runner's high" (really!!) you'll be hooked. There is no better feeling on earth than the exhilaration of a good run and the tired feeling of total satisfaction afterward. ARE THERE OTHER RUNNERS WHO INSPIRE YOU AND WHY? Brendan Siefker, a senior from Ottoville High School truly does inspire me. He was a soccer player turned distance runner. In his sophomore year he placed in the top five at the state cross country meet in his first season in the sport. I love that he has total joy and passion for the sport. What sealed the deal for me becoming one of his biggest fans was when he qualified for the state track and field meet in all three distance events, (1600, 800 and 3200) this past spring and ran them ALL, even winning the 1600! I mean, who does that? My most recent inspiration is my son Ty who is a junior at the University of Findlay and runs cross country and track. He has worked really hard this summer and I am so impressed with his drive and determination. He is really fun to watch in competition! I am so proud of him. I think he can accomplish anything he sets out to do. When did you start running: I had to start running in the Army, but started distance running in 1978. Highest weekly mileage: In my prime, I'd run 50-60 miles per week, but I've run over 70 to get ready for a marathon. Favorite road race: Luminaria 5K (The Luminaria 5K is the day after Thanksgiving and sponsored by the West Liberty Business Association). Favorite running memories: I have so many great running memories-running in team competitions was always fun, like the River to River Relay in Illinois, and so many more! People who inspire me: Lots of people inspire me. People who won't give up in spite of obstacles. My friend, Keith Matthews is one of those people. Also, some really gutsy cross country kids are an inspiration even to old guys like me. Advice to new runners: Be consistent. Don't get discouraged-remember running can be a lifelong love affair!